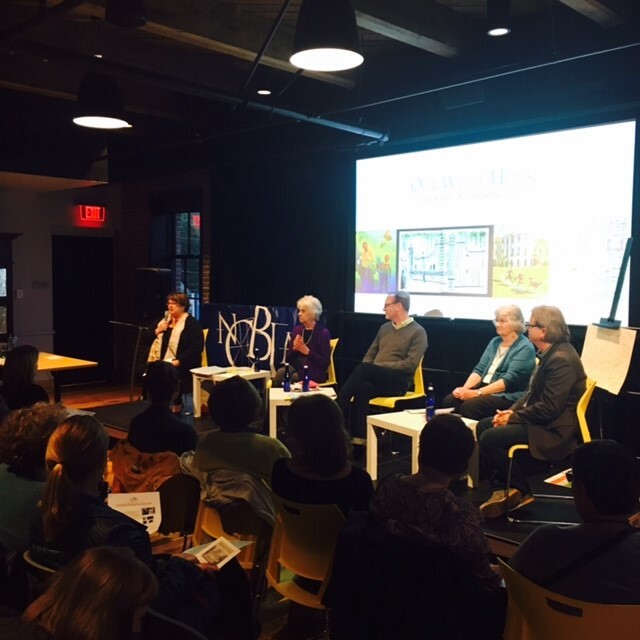 Left to right: Mary Brigid Barrett, Patricia MacLachlan, M. T. Anderson, Katherine Paterson, and Calef Brown. The National Children’s Book and Literacy Alliance presented Get Kids Excited About OUR WHITE HOUSE, Its Presidents, and the Election, a panel discussion featuring renowned authors for young people KATHERINE PATERSON, M. T. ANDERSON, CALEF BROWN, and PATRICIA MACLACHLAN and moderated by NCBLA President and Executive Director Mary Brigid Barrett in September 2016. The NCBLA’s award-winning anthology Our White House: Looking In, Looking Out provided the foundation for this exclusive, nonpartisan discussion designed to provide teachers, librarians, and parents with strategies on how to excite kids about American history, the presidents, and this year’s election. Get Kids Excited About OUR WHITE HOUSE was held at An Unlikely Story Bookstore & Cafe (created by Jeff Kinney) in Plainville, Massachusetts. We look forward to hosting more author events at this magical bookstore. To see a photo album from the event, please visit the NCBLA’s Facebook page. A video of the event will be linked to this page soon. Katherine Paterson is the author of Bridge to Terabithia and Jacob Have I Loved, both winners of the Newbery Medal. She has won the National Book Award twice and has received both the Astrid Lindgren Memorial Award and Hans Christian Andersen Medal. She served as the second United States National Ambassador for Young People’s Literature. Katherine is also a vice president of the board of directors of the NCBLA. Her most recent books are Giving Thanks: Poems, Prayers and Praise Songs of Thanksgiving (Chronicle Books) with illustrations by the renowned scherenschnitte artist Pamela Dalton and A Stubborn Sweetness and Other Stories for the Christmas Season (Westminster John Knox Press). 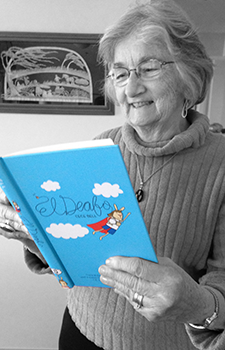 Katherine Paterson recommends El Deafo (Amulet Books, 2014), written and illustrated by Cece Bell, as a Great Read for ages 8-12. Check out more Great Reads here. Learn more about Paterson and her books on her website Terabithia.com and her Facebook page. To watch a video interview with Paterson by Reading Rockets, click here. M. T. Anderson has written stories for adults, picture books for children, adventure novels for young readers, and several books for older readers (both teens and adults). His satirical book Feed was a Finalist for the National Book Award and was the winner of the L.A. Times Book Prize. The first volume of his Octavian Nothing saga won the National Book Award and the Boston Globe-Horn Book Prize. Both the first and second volumes of that two-part series were Printz Honor Books. He has published stories for adults in literary journals like The Northwest Review, The Colorado Review, and Conjunctions. Be sure to check out Anderson’s books Symphony for the City of the Dead: Dmitri Shostakovich and the Siege of Leningrad (Candlewick, 2015), Feed (Candlewick, 2002), and Whales on Stilts (Harcourt, 2005). 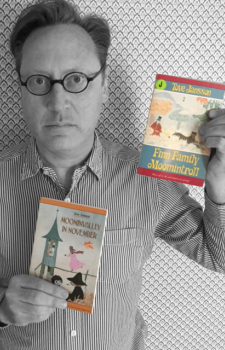 M. T. Anderson recommends the Moomintroll series by Tove Jansson (Farrar, Straus and Giroux) as Great Reads for ages 9-12. Check out more Great Reads here. To learn more about M. T. Anderson, visit his website mt-anderson.com. To read an interview with M. T. Anderson on AdLit.org, click here. Patricia MacLachlan is the author of a number of novels and picture books. She has won the Society of Children’s Book Writers and Illustrators Golden Kite Award and the Christopher Medal from the Christopher Society. She won the Newbery Medal for Sarah, Plain and Tall, which was produced as a Hallmark Hall of Fame movie, starring Glenn Close and Christopher Walken. Her novels, Skylark, Caleb’s Story, Baby, and Journey, were also made into movies. Her other novels include Arthur, For the Very First Time, Unclaimed Treasures, Cassie Binegar, and More Perfect Than the Moon. MacLachlan’s more recent novels are Fly Away, The Truth of Me, Waiting for the Magic, and White Fur Flying. Her newest picture book is The Iridescence of Birds, a book about Henri Matisse as a child. She has taught Children’s Literature at Smith College in Northampton, Massachusetts, and is a frequent lecturer. In 2003 she was awarded the National Humanities Medal for her work. 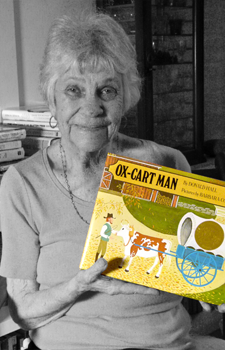 Patricia MacLachlan recommends Ox-Cart Man (Viking Press, 1979), written by Donald Hall and illustrated by Barbara Cooney, as a Great Read for ages 2-5. Check out more Great Reads here. To watch a video interview with MacLachlan by Open Road Media, click here. 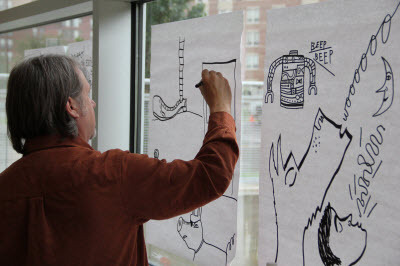 Calef Brown is the author and illustrator of many books for young people and has completed illustrations for publications as diverse as Time, Newsweek, Rolling Stone, Spin, The New Yorker, Sports Illustrated, and The New York Times. Calef Brown writes the following about his work, “Two things I like a whole lot: musical language and serious nonsense. My first book—Polkabats and Octopus Slacks: 14 Stories—was published in 1998 by Houghton Mifflin. People seemed to like it, and I very much enjoyed making it, so I have since written and illustrated many more. “I also continue to create illustration for other venues, and my artwork has been published in lots of magazines and used for murals, posters, book covers, and packaging. Visit the portfolio page on CalefBrown.com to see more. “I grew up in rural Vermont, upper west side Manhattan, row house Philadelphia, and suburban Boston. “Some of the first stories I wrote and illustrated concerned such subjects as a giant pile of stinky dead fish, people driving tables and bathtubs, tiny Vikings who live in cereal boxes and this one time when I got my tongue stuck to a freezer box. To watch a video of Calef Brown presenting—speaking and drawing—at the National Book Festival, click here. 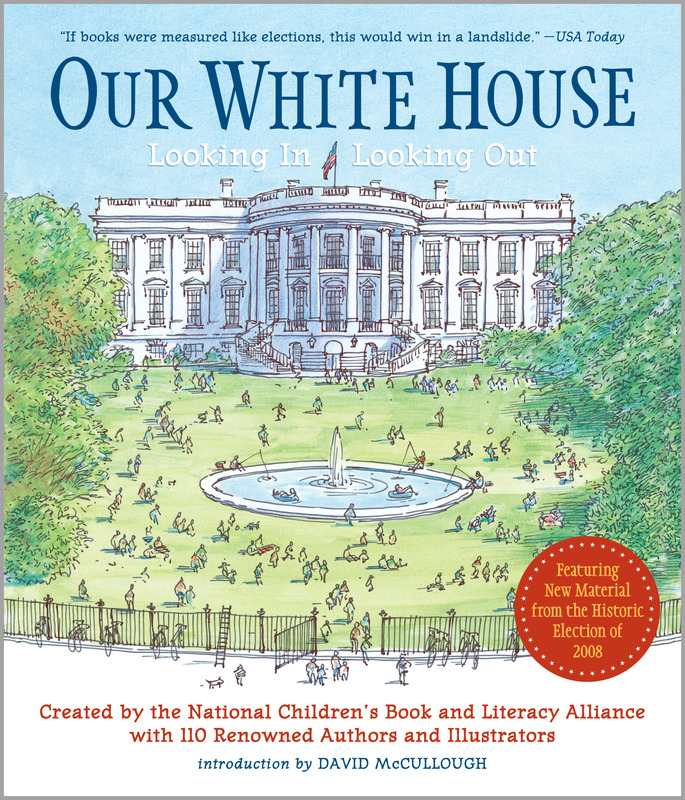 Our White House: Looking In, Looking Out is the extraordinary, award-winning anthology that will ignite young people’s interest in our nation’s past, as well as provoke them to thoughtfully consider our future! A creative tour de force, Our White House features the work of 110 award-winning contributors who donated original art, poetry, nonfiction, historical fiction, and personal essays to help the NCBLA promote both literacy and historical literacy. Equally suited for home and classroom use, Our White House is interdisciplinary in nature and multicultural in outlook. It stands on its own as an innovative concept covering 200 years of American history, but it also serves as a gateway book, inspiring young people to read more about our country’s rich heritage and culture. Our White House offers readers of all ages a vibrant way of looking at 1600 Pennsylvania Avenue – at the people who built it, have lived in it, and have been touched by it – and at the role we citizens have played in keeping it at the center of our astonishingly resilient and extraordinary democracy. This unprecedented anthology offers a dynamic view of American history that we hope will inspire young readers on their journeys to becoming the civic leaders of tomorrow! To learn more about Our White House: Looking In, Looking Out, click here. To expand and complement the content of the Our White House book, the NCBLA has published a companion educational website OurWhiteHouse.org, which includes additional primary and secondary source materials and articles, activities, and discussion questions related to book and website topics. Also included is an American history resource and literacy center, a guide to presidential field trip destinations, and an extensive young people’s bibliography.